Bell Rock and Courthouse Butte are two prominent sandstone peaks at the south edge of Sedona's red rock formations, at the center of what is probably the busiest hiking area in the region, since the rocks are easily accessed from the adjacent Highway 179, are viewed by several short, level trails, and are the first-reached scenic location for the majority of visitors, who arrive from I-17 to the south. 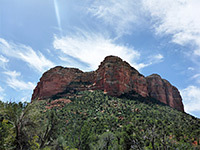 The rock is nearest the road, so sees by far the most people - either walking along the trail (Bell Rock Pathway) at the base, or climbing a little way up the slickrock slopes. The loop path round the larger Courthouse Butte to the east has more varied views and is less used, since it is quite long at 3.4 miles, or 4.1 miles if incorporating part of another path (Big Park Trail) to the south. 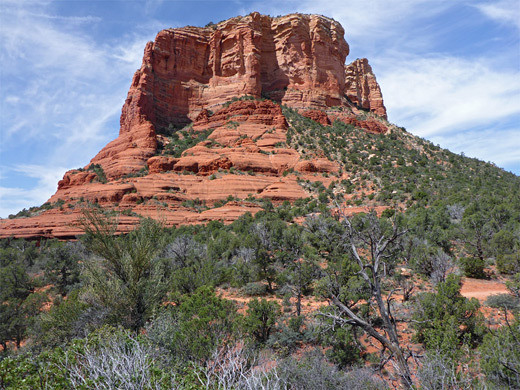 The loop has good views of both buttes from all directions, and of higher cliffs to the north, while encountering varying terrain of rocky terraces, dry washes, light woodland and flower-filled grassland. Most of the trail lacks shade so the hike is testing in summer, despite having only small changes in gradient. 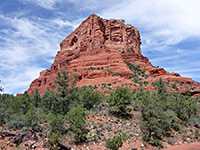 All trails in the area are open to horses, and most to bikes as well, though one section of the Courthouse Butte loop, on the east side, crosses part of the Munds Mountain Wilderness, so cycles cannot make the full loop. Two large parking areas serve the region, along Highway 179 just north of the Village of Oak Creek. The northernmost (Courthouse Vista) is closer to Bell Rock so is preferred if just visiting this feature, and also for the shortest loop around the butte, but the south parking lot (Bell Rock Vista) is best if hiking the slightly longer (and more interesting) loop that includes the Big Park Trail, and this is the hike described below. The southern trailhead has space for up to a hundred vehicles, but like the smaller lot to the north, still fills up completely by mid morning on busy days. Most people are here for the one mile walk north to Bell Rock; maybe only around five percent take the longer circuit of Courthouse Butte. From the south parking lot, the one path starts to the east and soon reaches the first junction. 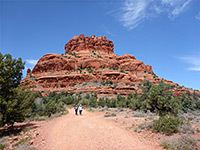 Bell Rock Pathway is north, while the Big Park Trail is east. The former, the two branches of the latter, and the short-cut Middle Trail all intersect the Courthouse Butte loop (see map below), providing several route options, the least crowded being the outer section of the Big Park Trail, accessed by turning right at a second junction just after the first. This trail proceeds east across sandy meadows home to many wildflowers in spring, most abundant white creamcups. The next major junction is with the Middle Trail, though several lesser paths fork off to the south, linking with residential roads in the adjacent Village. 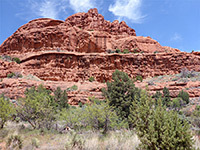 The Big Park Trail crosses a dry wash and enters bushier terrain, later bending to the north and descending to a wide section of the streambed of the same drainage, where it meets the Courthouse Butte Trail. This location is close to the southeast edge of the butte, which looks broadly similar in color and outline from all directions, and hence is not so interesting, photographically. The loop continues up the east side of the wash a short distance, crosses to the west and follows an upper fork of the drainage, gaining height steadily though not steeply, while staying the same distance from the butte. 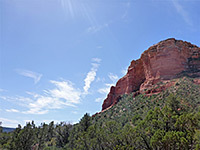 It reaches a saddle; a flat, reddish sandstone terrace beside a rounded formation known as Spaceship Rock, a vortex site. 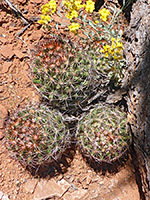 The slickrock persists a little way beyond, before giving way to a more overgrown, undulating area with many manzanita bushes, and large specimens of escobaria vivipara cacti. 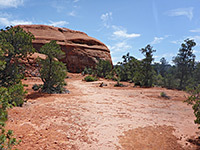 The route is wider now, and busier, as it moves westwards, past a junction with a connecting path to the Llama Trail (mostly used by mountain bikes), and approaches Bell Rock. Other trails branch off to the north, and two short paths to the south, both climbing a little way up the lower slopes of the rock. Yet another (unofficial) trail runs down the valley between the rock and the butte. 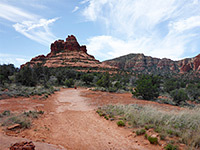 The loop hike is completed by walking south along the wide Bell Rock Pathway for one mile, back to the southern trailhead.